It is strange how we live in a world that is built upon automation and repeated forms, and yet architecture is by and large a practice of customization. Every client demands something unique, and architects demand it of themselves. From an industrial, economic, and in some ways environmental point of view, architecture’s chief goal should be to find the single best kind of building that will be replicable and applicable around the world, just like a car or a fork is. That design could sit lightly on the ground, use up minimal resources– saving human labor to design and human labor to build. It would be attachable to others with simple mechanical means and would be connected with stairways, elevators, other conveyance systems that are manufactured separately…. Ivan– you’ve fallen into a trap. Architecture is different from forks and cars because its context is always different. A fork lives happily on a table, and tables in China are almost identical to tables in Ecuador. A car lives happily on the flat asphalt of a highway, which is almost identical anywhere in the world you look. Architecture does not get to live in this bubble, and that is what sets it apart. It must bravely encounter nature, in the raw, in all its variety and change. This is why architecture is by and large a practice of customization. It is why ‘the architect’ will always have a role to play in the erection of shelter– there are always changing conditions around us, as well as the desires within the soul to make the most out of a dwelling place. This change confounds the automaton, and is a problem uniquely made for the human mind. Studying the architects that encounter nature best is like experiencing small re-births. Each one pushes limits, inspires us to envision what we don’t know. Anything humans create, be it buildings or music or words, are at their best a flashlight into unexplored rooms. Bruce Goff, Bavinger House sketch; via Art Institute of Chicago. Makovecz’s best work looks like it was done by progressive vikings. Rounded stucco facades, pointed roofs, and wood framing that looks like an upturned ship all give new life to old forms. Using hand-applied thin wood sheathing he achieves Gaudi-esque undulations. They look like animal skins or ancient armor. The buildings strike a balance between random motion and symmetry. 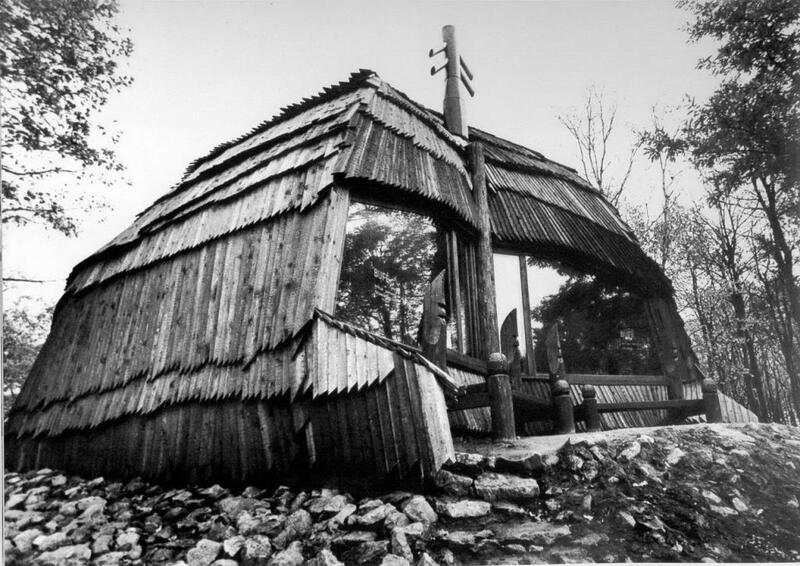 Imre Makovecz house; via eloepiteszet.hu. For something akin to a manifesto, but written more softly, I choose Kendrick Bangs Kellogg. If it is not a love affair with Mother Earth, it is not Architecture. There should be as many original styles of Architecture as there are individuals. Since it is paramount that form and function are one, where license will not save us, OACF focuses on engineering and learning “in the field” by doing, better than Frank Lloyd Wright’s preliminary experience, but not his talent that comes from with-in. Whenever health, safety, environment, diversity and the rights of the individual is inconsistent with other interests sought or promoted by others, it is paramount that structural engineering and in-field construction by the Participant be encouraged. OACF is for Participants that are individuals that have “rights (that) existed by the law of the land long antecedent to the organization of the State”. Hale v. Henkel 201 U.S. 43 at 47 (1905). Plagiarizing is not going to do it…Earth is one of a kind….Please don’t destroy it. Kendrick Bangs Kellogg; Joshua Tree House; via kendrickbangskellogg.com. Scaly, bony, cavernous… benefiting certainly from the desert climate. These architects let us get away from the cliche of architects as “masters”– because what would they be mastering? Their whole stance is one of balance with and respect of nature. In this way there is no longer a master/slave relationship (where intellectual, sophisticated man is enlightening a frontier or harvesting resources), but a collaboration between equals. At this point, architecture can basically be dropped from the equation. Bruce Lee gives us the same philosophy in his Lost Interview, but through martial arts. To express oneself with one’s body is to fall into the grand design of nature, and in this way one becomes a master of non-mastery. Skip to 5:40 for his description of the combination of yin & yang. How does one achieve this being of non-being? This acting of non-acting? This building of non-building? At 15:42, Bruce Lee tells us to elevate nature in our minds: not only to respect it, but to aspire to it. It presents to us the full spectrum of being. If you want to live in a continuous present, you have to become one with your surroundings. Be formless. Be water.